Color can be used sparingly -- even in family-friendly animation. I don't hear NPR's movie critic Bob Mondello all that often anymore ('cause I'm not in my car as much as I used to be), but I've never heard him more excited than when he reviewed "Journey to the Center of the Earth" (1959) last week. Not the new Brendan Fraser 3D one, but the 1959 version with James Mason, Pat Boone, Arlene Dahl and Diane Baker. Although Mondello's greatest enthusiasm by far is for the 1959 film, his best lines describe the 2008 production: "It's considerably more "real"-looking -- in a differently fakey way.... It'll just show you what Hollywood used to do, and do well, done well." Well put. As I was saying about movie blood, what we accept as "realistic" isn't necessarily realistic at all. It's as much a convention of the times we live in as anything else. Much of the groundbreaking CGI of today isn't much better than it was ten years ago, and a lot of the old CGI -- which seemed so convincing at the time -- now looks... well, better than the rubber octopus in "Ed Wood," but dated nevertheless. Even some of the great special effects movies like "Jurassic Park" (1993) don't look much more sophisticated than "King Kong" (1930) these days. "I geeked out at the idea of being able to do a much more monochromatic palette. That's not usually associated with animated pictures because there's this stigma of it being a babysitter or family fare and it has to have every color of the rainbow in it, and all that stuff -- which really makes me want to go in the other direction when I hear that. And I loved that just the natural setting [Earth as a big dump] required a monochromatic bent to it, at least in the beginning of the film. So it's dealing with a lots of yellows and tans and browns. 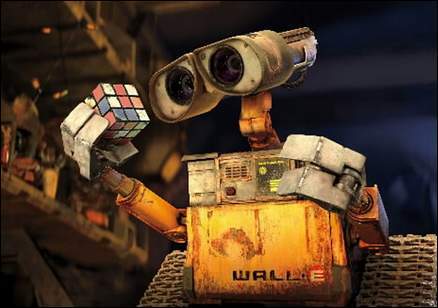 It made anything primary, like even the chipped-away red circle of Wall-E's "E," or the one time you finally see something real like a plant, really stand out. It's almost like having the restraint of using a close-up and not using it until the very right moment. It suddenly has a huge impact when it's used. How cool is that? An animator who understands the psychologically effective uses of color... and close-ups!